Would aeroplanes be safer if they were flown by computers? Why can’t you get life-saving drugs for free? Isn’t hydrogen too dangerous to use as a fuel? Provocative questions in science and technology were at the top of the agenda at a special TextWorkshop this week. We were training a diverse group of engineers in how to respond to questions that visitors will pose after a visit to the Science Museum’s news gallery Antenna, or its website. 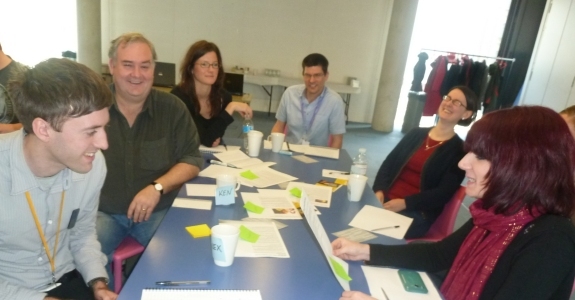 The big idea was that a good answer should open up new questions to explore – promoting discussion and debate. The engineers, who included an expert in gyrocopters, a triathlete and someone whose favourite word was ‘penumbra’, are involved in a project funded by the Royal Academy of Engineering and hosted by the Science Museum, aimed at equipping working engineers to respond to visitors’ questions and promote dialogue. As our expert guest speaker we were delighted to welcome Vitali Vitaliev, a veteran journalist who edits the award-winning magazine Engineering and Technology. Vitali’s provocative past actions in journalism eventually caused him to defect from Russia, and his frank and funny columns have appeared everywhere from Punch to the South China Morning Post.